Tirupati, the seventh biggest city of Indian state of Andhra Pradesh, is a major pilgrimage city. The city lies in the Chittoor district of the State. Famous for its many Temples in and around it, the city is also known for economic and educational hub in the southern parts of the state. Temperature of the city ranges from 40 to 45 in summer and in winter it is between 15 to 22. Apart from Telugu, native language of the city, Tamil is also spoken widely as many people from Tamil Nadu reside there. 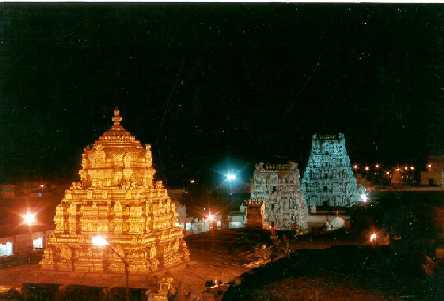 The city of Tirupati takes pride in housing many places of religious importance in and around the city. The famous Venketeshwara Swami temple, located at just 10km of north-west of Trupati in the Tirumala Hills, attracts thousands of pilgrims from other parts of the state and the country. It is one the most of important temples of India and is dedicated to Lord Venketeshwara. Koadanda Rama Swami temple is another important temple of Tirupati and it lies in the center of city. Lord Rama, Sita and Lakshmana are main deities of the temple. Colored in gold and white ISKON Lord Krishna temple is yet another main religious place of the city. Shree Venketeshawr zoological park is another place of attraction of Tirupati. The park is second of its kind in Andhra Pradesh and its houses many different kinds of animals including tigers. The city also has Regional Science Center with planetarium and attracts a good crowd. Lord Mahadehva temple at Yogimallavaram and Hanuman temple at Tirumala are some of the many other temples to be seen here. Other temples, within 40 km of the city, include Avanakshamma temple, Shree Venugopala Swamy temple, Shree Prasanna Venketeshwara Swami temple and Parashurameshwara temple. The city of Tirupati is well connected to other parts of the state and country by rail, road and air. It is connected by rail to other cities like Chennai, Bangalore Hyderabad etc. it is also connected by Chennai sub-urban railway. State run buses connect the city to other towns and cities of the state. There are private luxury buses available from other parts the country to visit the city. Tirupati domestic airport, located 15 km from the center of the city, has many flights from cities like Chennai, Delhi, Bangalore, Hyderabad etc. Bramvhostava festival in Tirupati is celebrated over the nine days. The festival comes in the month of October every year and is one of the most auspicious events in Tirupati and it draws many people from other parts of the state and the country.